The tool NSF file Splitter splits all the items of Lotus notes archive which includes: emails, contacts, and some other files. Or if you want to delete the large NSF file, go for it. If user wants to divide their large sized Lotus notes archive into small chunks of file, then use this Software. User can define the size range between 5 MB to 10 GB of the resultant file within the software and reduce the size of the database file. In this feature of the software users can filter their email items according to the date from the large sized NSF file. They just need to mention the date of which mail items are required from the Lotus notes database file. User's can also split their NSF file according to the year. For example: if the user select the year duration from 2010 to 2015 then the NSF File splitter software will split the database file and creates 5 individual NSF files, one file for each year. This software has an option to split large sized NSF database according to the folder. In this option software will create an individual file of every folder of the NSF file. And users can also divide the size of particular large sized folder in two equal sized files of that folder. The NSF splitter maintains the hierarchy of the mail items of the Lotus notes archive file even after the process. The software also holds the integrity of email metadata and attached files. The user of the software can view their data as it was before the process. Lotus Notes installation is required for the software. This tool supported by all the latest and earlier versions of the lotus notes. 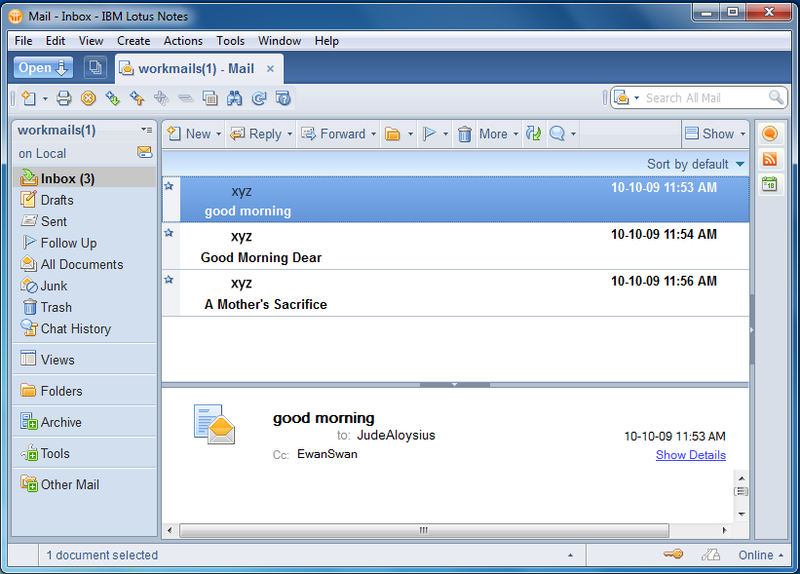 The tool is compatible with Lotus notes 9.0, 8.0, 8.5, 7, 6 & below version. After the whole process done the software will create the process report in CSV file format. 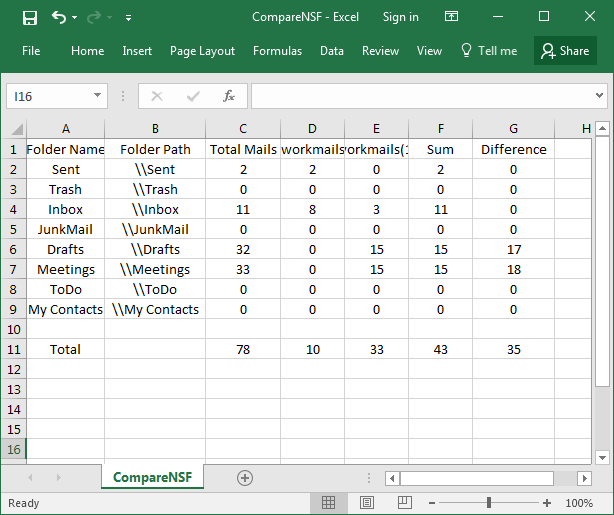 Users can click on the compare NSF button and generate the report file to know the difference before and after splitting the NSF file. 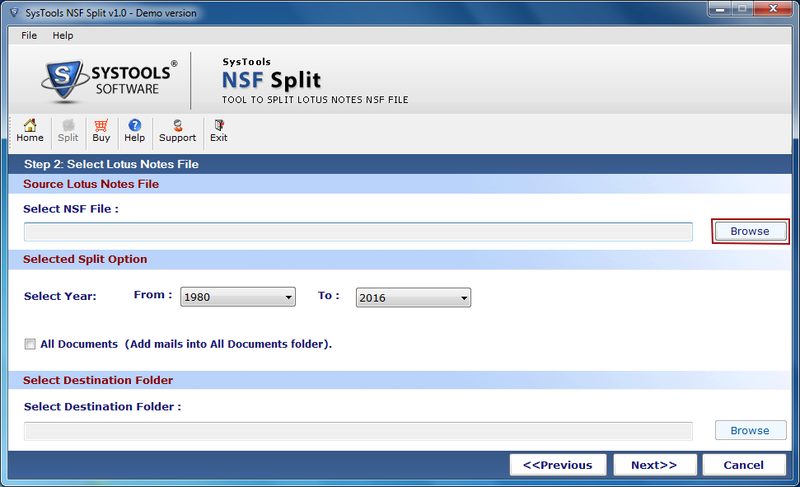 Why Need to Split Lotus Notes NSF Archives? Large sized Lotus Notes NSF file cause many issues like it may always prone to corruption, it may take enough time to be accessed or you can face many issues while operating and managing the file. To make the file easy to access and not cause corruption of data, split the NSF file into multiple NSF files. NSF file Splitter is the best tool to divide the large size Lotus notes database NSF file. Step 1: Launch the Software and Click on the "Split" option from the main menu. Step 2: Select the "Split Option" from the list and Click "Next" button. Step 3: If you Choose "Split by Size" then you will see the screen below. "Browse" the targeted file then mention the size of reslutant file. Afterwards select the "Destination path" and press down "Next" button. Step 4: If you choose "Split by Date" then select the date and fill the other information. Click on "Next" button. Step 5: If you selected "Split by Year" then enter the duration of year in "From" and "To" field. Then select the destination path and click on "Next" button. Step 6: If you choose "Split by Folder" then select the folder of targeted file and also have option to split that folder by size. hit the "Next" button. Step 7: Software will show the "Split Details" before the Splitting process. Click on "Split" button. Step 8: The process will be start and it will show all the live status report of the process. Step 9: The files have been split successfully and tool will create a report of process with all details. Step 10: Now you will see the Split files in the destination folder. Step 11: You can see your all file in your mail client. Is the software safe to use? Yes, The software is easy to use and safe for the data in all manner. It provides you virus free result. The tool performs every action in a safe manner. It keeps your NSF file's data intact and untouched without any change. Is there any size limitation for selecting an NSF database file? No, there is no size limitation for the NSF file to split. You can select and divide any sized NSF file. The software first scans, detect your preferences and then split the NSF file according to user requirement. What are the different options provided by an NSF file splitter? There are different options provided by NSF file splitter tool to divide NSF file database. Users of the tool can split their database file by size, date, year and by folder. If you need to split files by size you need to define the file size within the software. If you want to split NSF file by date or year you should define the time period or year. Or you want to split an NSF file by a folder, then you should have to enter the folder names. Does the software support corrupted NSF file? No, the software does not support corrupted NSF database. If your NSF file is corrupted then you need to repair the file, then you can use our tool without any issue. I have a large sized NSF file and whenever I want to access the file it takes lots of time to open and sometimes it gets stuck. Then I came across NSF File Splitter tool, then I decided to split my file in several NSF files. The tool works amazingly and now I can access my data without any issue. Thanks to NSF file splitter tool to save my time and job. I have to send an import mail folders to my seniors from my NSF database file, the tool makes my work easy and quick. Because of this tool I able to send my files within a minute. I used this tool Lotus notes NSF file splitter, the tool works well and easy to handle. I am not a tech person, though I can understand the functionality of the tool. It makes my work so easy and special thanks to support team to solve my query on every step.